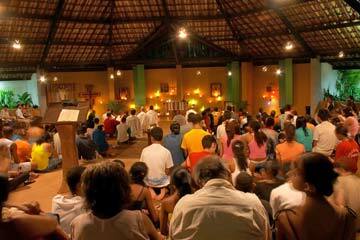 Taizé brothers have been living in Brazil since 1966. The first "fraternity" (house) was at Recife, in the North East of Brazil, in the diocese of Bishop Helder Camara, with whom Brother Roger had established a close friendship during the Second Vatican Council. From 1972, the brothers lived at Vitória, 1,700 km further south. In 1978 they returned to the North East, to Alagoinhas, a medium sized town, 110 km from Salvador. The brothers live there in a poor district in the suburbs. In this region of Brazil, 80% of the population are of African origin. The poverty is quite visible, but what most impresses visitors from elsewhere is the smiling welcome of those who live here, especially the children. On a four acre plot lent by the diocese, the brothers began by building a small bamboo chapel. Little by little a reception centre appeared. Then a larger church became necessary, for people coming to take part in meetings as well as for people from the neighbourhood. At the start, the brothers set up a neighbourhood association to take care of the most urgent needs: running water, electricity, a bus service, a creche... In around 15 years, 160 working class houses were built. It was necessary to improvise some kind of schooling. This gradually became a regular day school. Since 1999, the school has welcomed deaf children, the blind and visually impaired, and even some who are deaf and blind. If you also include children affected by serious family problems, the total number of pupils with a disability is over 40%. The "Emmanus" children. To look after all this work for human and social development a foundation has been created. It is independent of the brothers. Another association looks after a home for old people who are poor. Children come to the community house each afternoon. 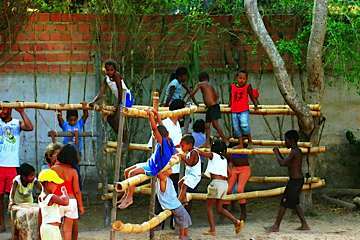 The "brincadeira" They find a place to play and a little food. Without realising it, they also learn how to live together more peacefully. Young volunteers help with welcoming the children. During the school holidays and every Saturday, older children teach the younger ones. In this way, children from "problem families" become familiar with school. In January the fraternity organises holiday camps for the children. In order to welcome individuals and groups wanting a time of prayer and exchange, the fraternity has opened a house for meetings and retreats. 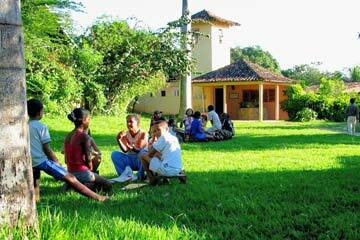 The house is called "Mombitaba" which means "place of rest" in the Tupi-Guarani language. Guests are invited to join in the community prayers for which the brothers gather three times a day.